You may, however, find the answer to your question here…. Why can’t I find the food I’m looking for? Why doesn’t the GM status of your foods agree with lists I’ve seen on the internet? 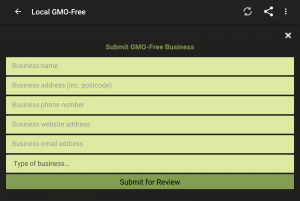 Why does a food you say is GM-free contain modified starch or corn? 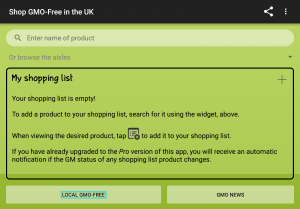 How can I find GM-free alternatives to my regular purchases? How can I contact the manufacturer of a product? I have a question about a product I’m viewing? How can I let my friends know quickly that a food contains GMs? 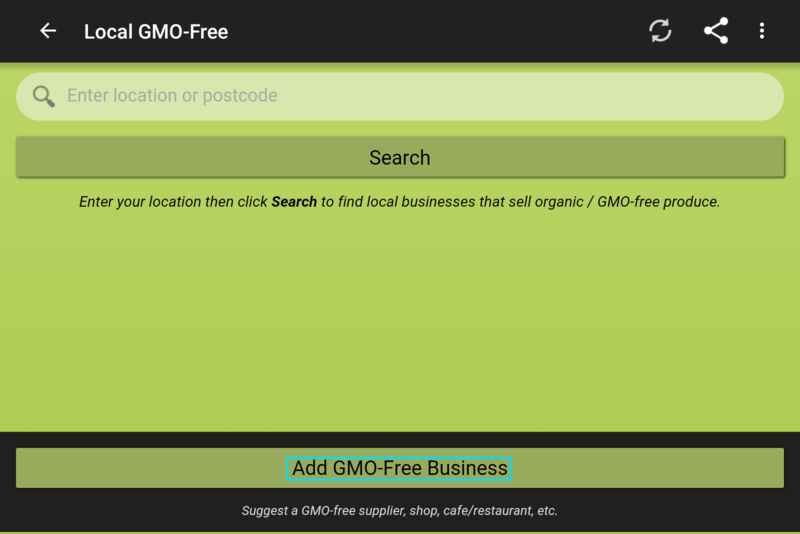 How can I search by category of product to find which are GM-free? Where can I find other features in the app? How can I let others know about my favourite suppliers? 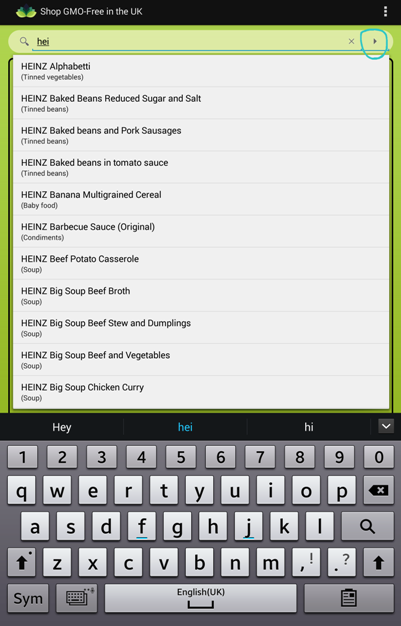 There are more than 17,000 foods in this app, so it may well be that you’re not spelling it correctly? You only have to know the first few letters. 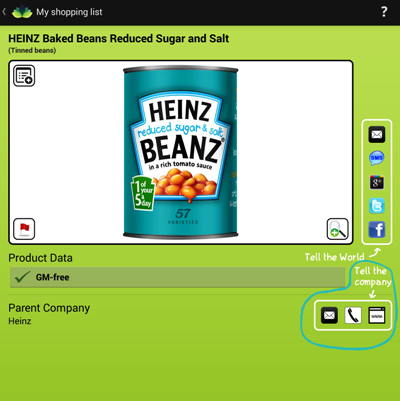 For instance, if it’s Heinz Baked Beans, just type in ‘hei’ and a dropdown menu will appear of all Heinz’s products. Just click on the one that you’re looking for, or just scroll through the list. 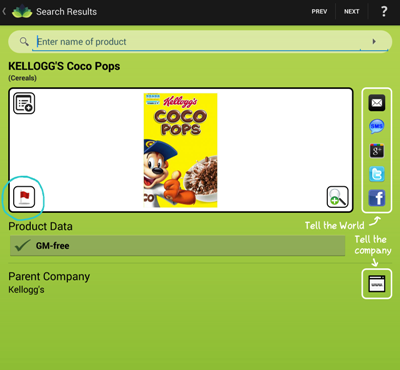 (You can also use the arrow icon at the right hand top to bring the products on the main screen to view and scroll). Please remember we have entered the data using the exact spellings that the manufacturers use. If you still can’t find it, and it’s quite an obscure or new food, the chances are that we may not have listed it yet. 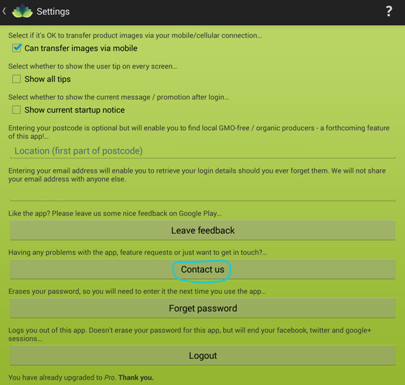 Just click on the Contact Us within the app, as shown on the screenshot below, and let us know about it? The lists on the internet are of American foods. 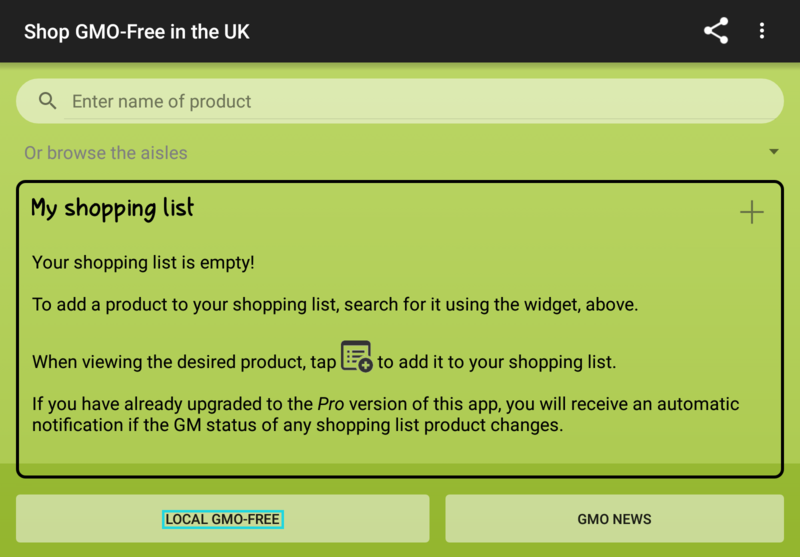 The list in this app is the only one in existence showing the GM-status of more than 16,000 foods sold in the UK. The situation in America is very different and because of this, global manufacturers have sourced their ingredients differently for the different markets. 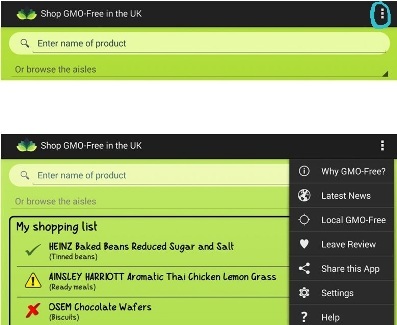 Because the UK has always been vociferously anti-GM, in many cases they have acted accordingly and only sourced GM-free ingredients for their products. ‘Modified’ shouldn’t be confused with ‘genetically modified’. ‘Modified’ means just that – modified. To modify something means to change it in some way, even to improve it. If you paint a table white, you have modified that table. Genetically modified means something else… it means that the starch comes from genetically engineered plants – plants where the DNA has been modified or changed to produce novel components which wouldn’t have occurred naturally, either through fertilisation or natural recombination. Click on the Smart Search button – we’ve put a blue circle round it in the screenshot below. See the buttons in the blue circle on the bottom left of the screen, to get a choice of how to contact them. Just click on the red flag and you can then send us a direct message. 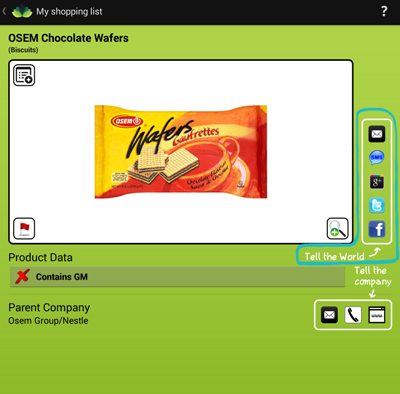 You can instantly tweet or send into your Facebook stream the GM-status of any food item. All you have to do is push the Facebook button next to the product, or the Tweetie bird, or the Google+ button … and we’ll do the rest. You can also email a friend or send out the info via SMS. 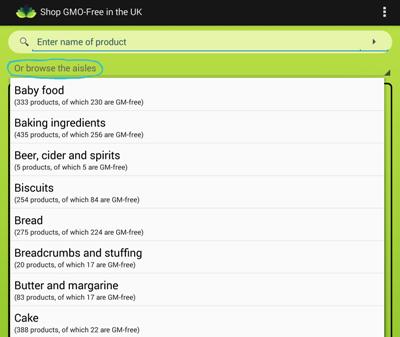 Our Browse the Aisles feature (see blue circled icon below) will enable you to search by product category. 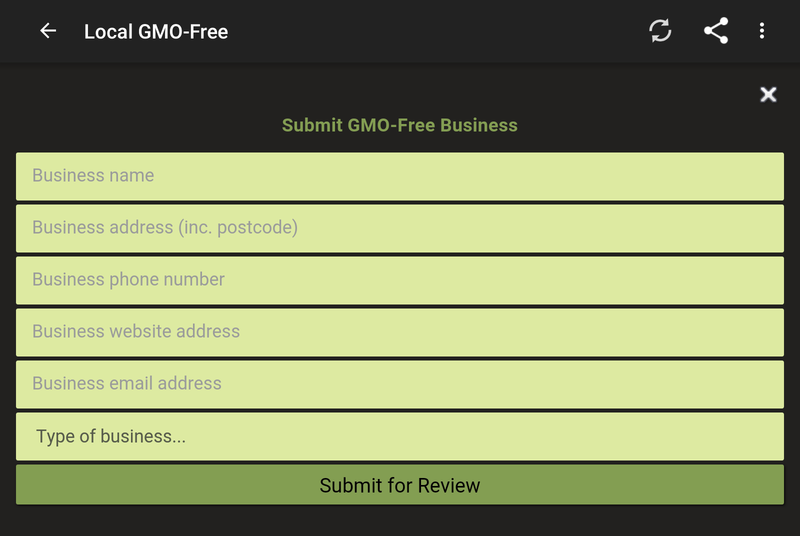 All products are listed alphabetically, and so with the use of this Smart Search feature, you will be able to quickly find GM-free alternatives within each category. Where can I find the other features in the app? Just click on the three dots (circled in blue below) and a drop down menu will appear revealing the other features. 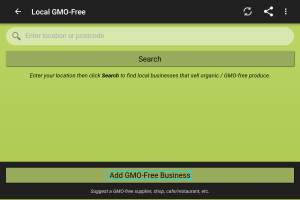 Here’s how to add your own favourite suppliers that stock GM-free and organic foods in their shops, cafes and restaurants – and also tell us about suppliers and producers, both local and national. 3. Then fill out the details and submit for review.